Ten years ago, it would have been inconceivable to adapt Neil Gaiman and Terry Pratchett’s 1990 fantasy novel Good Omens for the screen. Written “as a bit of fun” between the two friends who “weren’t famous at the time”, the book finds angel Aziraphale and demon Crowley trying to prevent the End Times. An adaptation of the book – which has always been notoriously challenging to actualise with countless TV writers turning down the job over the years – was Pratchett’s last request before his death in 2015. Honouring his wishes, Gaiman – whose oeuvre includes the likes of American Gods and Coraline – began work on the script a week after the funeral, embarking on a two-year process that “trumped everything else”. 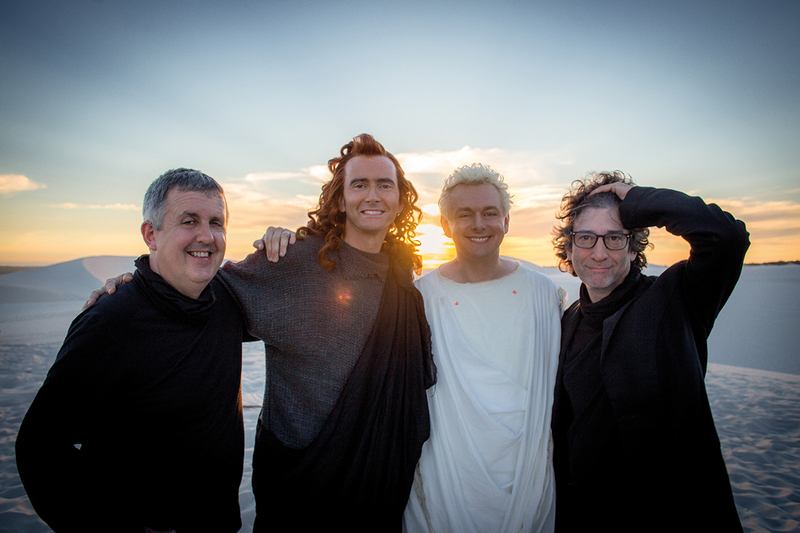 Although a price-tag for the big-budget adaptation has yet to emerge, the David Tennant and Michael Sheen-fronted Good Omens – the first co-production between BBC Studios and Amazon Studios – is a technicolor feast for the eyes, elevated by state-of-the-art tech that creates an immersive and otherworldly experience for audiences. “Years ago, you wouldn’t have seen TV platforms willing to take a risk like that, putting this much money in,” explains BBC Studios’ comedy head Chris Sussman. While much has been said about the release strategy for the show, which sees Amazon debut the six-part series on 31 May with BBC Two following at least six months later, Sussman says the producer couldn’t have asked for a better creative partner. “There are some new paths to forge, but Amazon have been an incredible partner. They’re very good at backing creatives and they let you make the show you want,” he tells TBI. Amazon’s backing has also enabled the show to be one of the most premium efforts to come out of scripted at the BBC in the last decade. Executive producer Rob Wilkins reckons the production’s special effects have even surpassed films such as Peter Jackson’s Lord Of The Rings trilogy, which is also being adapted for TV by Amazon. “If you look at Lord Of The Rings on the big screen now, you can see where certain things are stitched together. You won’t see that with Good Omens,” he says of the trilogy. Indeed, what is evident across the footage, seen by TBI, is that CGI and storytelling is integrated in a fresh new way. The creative team is upfront about the fact that, although the show is indisputably loyal to Gaiman and Pratchett’s source material, liberties have been taken to elevate the narrative. “We’ve taken departures because [the TV show is] a different thing,” explains Mackinnon, highlighting Jon Hamm’s archangel Gabriel character. Elsewhere, while Shakespeare is mentioned once in the novel, the English writer gets an entire sequence shot out of London’s Globe Theatre in the show. In addition, Gaiman has written a half-hour explanation of Crowley’s backstory at the beginning of the third episode that is completely original. “But the fans of the book will see that as a treat rather than a bad diversion,” assures Mackinnon. 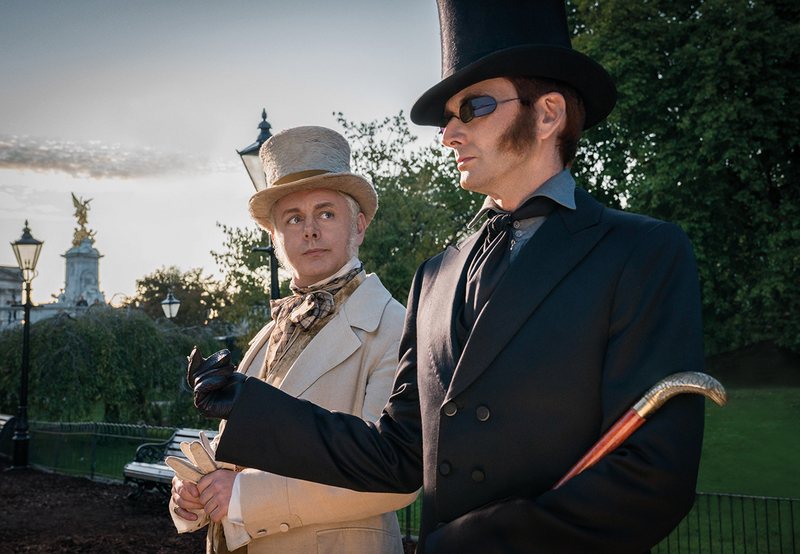 Lead stars Michael Sheen, who plays angel Aziraphale, and David Tennant, a demon named Crowley, tell TBI that with Neil Gaiman on board, the TV adaptation was able to be comfortably creative with scenes that enhanced the source material. “There’s a fairly major section at the beginning of episode three, which in a series of 10 or so scenes we see the development of the relationship between Aziraphale and Crowley from the Garden of Eden, all the way through the history of the world, up to the present day,” says Sheen. Tennant adds: “It’s very much in the spirit of the book, but that’s the good thing about having Neil involved. This world is so unique and it’s such an unusual voice that if anyone else was to do it, it would somehow be normalised. However, with Amazon on board and a global audience in mind, the stars admit that there were some taste tests administered.